Cooking in my crockpot is probably one of my favorite ways to cook a meal. It’s quick, easy and most of the time you’ll get a delicious flavorful meal for your family with little effort. Chicken is actually one of the things that I cook the most in my trusty crock-pot. There are so many different meals that you can make with chicken and most of these best chicken crockpot recipes below only require a few steps. I’ve searched the internet and found some of the best chicken crockpot recipes that are oh so good! You’ll find sandwich recipes, soup recipes, pasta recipes and more. And the main ingredient of all of them is chicken. 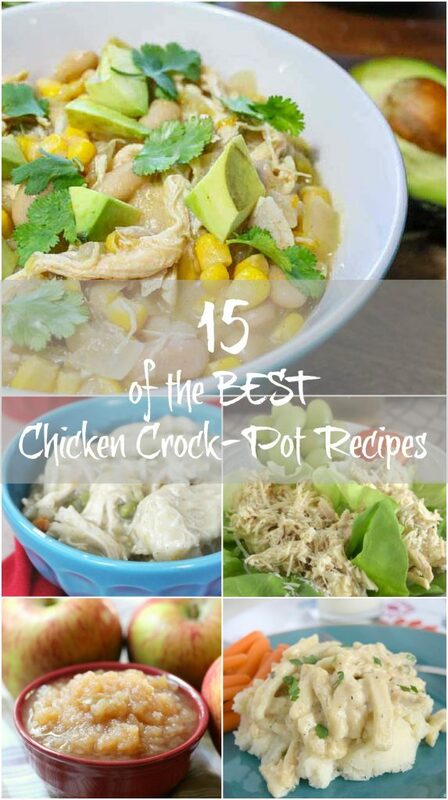 So without further ado, here are the 15 Easy and best chicken crockpot recipes. Slow Cooker Shredded Caesar Chicken – Who Needs A Cape? Slow Cooker Creamy Chicken & Noodles – Who Needs A Cape? Artichoke & Lemon Slow Cooker Chicken-Who Needs a Cape? Chicken goes on sale often so many of these chicken crockpot recipes are also very inexpensive to make. Happy Crockpotting!